It’s not often that Google’s charm offensives are successful—case in point, the Android weather frog—but in the case of Google’s Chrome Music Lab, it wildly succeeds. Google’s Chrome Music Lab is a collection of Chrome “experiments,” all featuring Web technologies like WebGL that run inside the Google Chrome browser. Google said that it created the experiments as part of Music In Our Schools month, but the experience should appeal to adults and kids alike: It’s like a Web-based Exploratorium for sound. 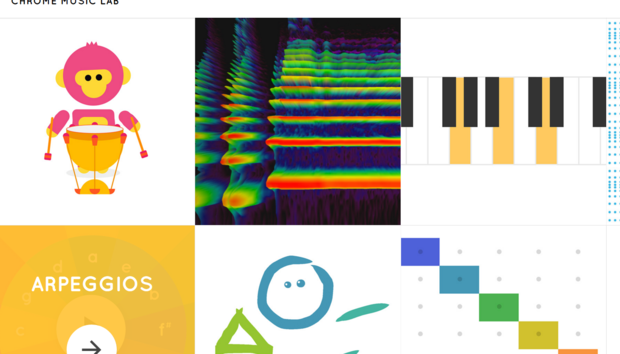 In all, the dozen experiments that Google has posted to the Web teach music as both art and science: as a matrix of particles vibrating as sound waves move through them, and how those sounds can be combined to form rhythm and melody alike. Even basic sound concepts are taught with obvious thought to how they can be made fresh and interesting: There’s a basic spectrogram, but sounds are intriguingly represented as three-dimensional waveforms, with recorded sounds of birds, instruments, a modem, and even your own voice (via your mic) shown on screen. Pitch changing is represented as a “voice spinner” where you can loop a sample of recorded audio forwards and back, either fast or slooooooowly. And then the exhibits take a turn toward the fantastic, where Wassily Kandinsky’s “sound of colors” is explored through the ability to “draw” sounds. Google has architected the experiments with enough depth to allow kids and adults alike to spend a few minutes with each one, exploring the variations therein. It’s a rare mixture of art and science, and one that does the Web as a medium proud.